The Prince George Airport Authority (PGAA) understands the importance of being involved in our community. Every summer, the PGAA hosts their annual Charity Golf Tournament open to all stakeholders, associates, partners, and friends. All proceeds from prize draws and other activities conducted at the tournament are donated to charity. The Prince George Airport (YXS) also participates in fundraising events such as the Festival of Trees, the Salvation Army Kettle Campaign and their Adopt a Family program at Christmas. Other charities/community groups the airport supports include the Mustard Seed, the PG Cougars, BC SPCA North Cariboo Branch, Variety – the Children’s Charity, UNBC JDC West and the Fire Pit Cultural Centre to name a few. The Prince George Airport Authority hosts an annual charity golf tournament every summer with proceeds supporting Hope Air. This event has brought in tens of thousands of dollars for a national charity that is close to our hearts. In British Columbia, Hope Air arranged 7,357 flights last year, with almost 3,000 flights going to children who needed healthcare far from home. Prince George continues to be one of the busiest departure airports, with 1,898 flights for local residents in 2017. Planning has already begun for the 2019 tournament and a date will be posted here as soon as we have secured it. A huge thank you to the sponsors and volunteers who make this event a success year after year. 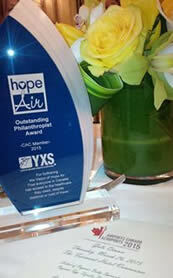 In March 2015, the Prince George Airport Authority was the recipient of Hope Air’s “Outstanding Philanthropist Award.” The PGAA was presented with this incredible hardware in Vancouver at the Canadian Airport Council’s Airports Canada Conference. We are so humbled and thankful to the Prince George community for helping us help Hope Air. The PGAA is very active in fulfilling donation requests from charitable and non-profit organizations to assist with their fundraising efforts in exchange for promoting YXS at events. The PGAA helps raise thousands of dollars for charities and benefits every year because we feel it is important to give back to the communities in which we serve. Click here for more information or to make a donation request! 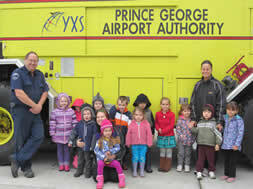 The Prince George Airport offers tours to local school groups. Visits last approximately 60 minutes and include a wide range of activities. Tours are only held between 9:00 and 3:00, Monday – Friday. Public tours run from April – October. Please note EVERY person who participates must sign a photo/video release and indemnification form regardless of age. If you would like to book a tour of YXS, please complete and submit the form below. Tour groups can not exceed 25 people and must have a minimum of 1 adult per 8 children. *Public tours do not include access to airplanes. I consent to my submitted data being collected, stored as well as being contacted by Prince George Airport.